« Are We Headed Back To 1980? The chart shows monthly data from 1900 to February 2009 and is logarithmically scaled so that a percentage move in any year is comparable to other years. I’ve used the CPI (monthly) data available from official US government sources. Some say it is under-reported but what other real alternatives do we have? Removing the distorting effect of inflation is important for long term charts but also because we know that the Fed is doing all it can to create inflation. The most recent data shows the largest one year increase in money supply. Like walking down your hometown streets, things look similar but different. For example, the chart doesn’t show the massive double top that is now recognized by everyone. Also, from 1900 to 1950, the market tread water after inflation. Then a roaring bull market followed, to then be deflated by an equally intense bear market. Most interesting is that the bear market low is July 1982 - not 1975 as we usually see on non-inflation adjusted charts. This is where the bull market that followed next was launched. The inflation adjusted level of 238 acted as support, just as it had acted as resistance on so many occasions (temporarily pierced only by the roaring bull market of the 1920’s). A similar situation is setting up today. We had a bull market that took us to new inflation adjusted levels and subsequently almost all the air was let out because the market is now back to where it broke out from the 1968 top. To be accurate we have a little more air to let out before the market ricochets off that level once again. Assuming that this is the playbook the market is following; and if not, cheer up! we can only go to zero. great article. 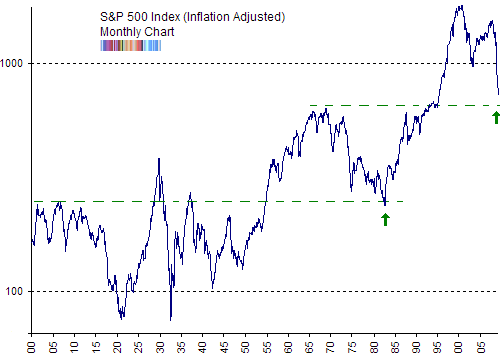 Right now I see a confluence of support on the non-inflation adjusted S&P 500 chart as well. Not sure if we need a complete washout before we can move back up. Time will tell. Best to be prepared for a snap back rally though. Could happen anytime IMHO. the chart doesn’t show the massive double top that is now recognized by everyone. Hm, what? I can see that double top right there, on the right. The time scale is long, so it doesn’t look as huge, but it’s right there. Even more interesting, it looks like we don’t need the SPX to go to negative numbers just to retrace that double top and equal amount downward. In adjusted-for-inflation terms, we’ve already done most of the retracement. Olivier, thanks, I hadn’t looked at it that way. Tom, for shorter term charts, that’s fine. When you go beyond 50+ years then inflation can make a difference. ST, well, perhaps a very sloppy double top then? yes, the previous full measured move idea was tongue in cheek. Since the CPI methodology has been modified many times during the past 30 years, I would also draw the following chart of the S&P priced in Gold and also using a couple of different discounting methods, like MZM or M0 changes instead of CPI. What do you think? And by the way, no way FED can inflate itself out of this mess anymore… with credit bubble, inflation won’t work… just like Japan, did it work?! I DON’T THINK SO! America IS GOING DOWN! Based on that chart, I would expect the market to fall to the 1982 low. It looks like adjusted for inflation, the market moves in broad ranges until some major shift takes place. The New Deal created a strong middle class, lifting the market to a higher range after 1950. Supply side economics and the glorification of the investing class lifted the market to a higher range starting in the 80’s and strengthened in the 90’s as banking regulations were removed and banks did crazy stupid things with leverage. Since it looks like we will be putting the banks back under reasonable policies and favoring workers over investors again, I would expect the market to move back to the middle range. We might also overshoot to the bottom a little bit. Awesome information and chart. Love it. This was exactly what I was looking for. I have done the same calculations for the Australian All Ordinaries since 1900 and i have come to exactly the same conclusions as you have for the S&P 500. The take off date was 1982 which coincidently is about the date that daily market data exists for many desk top charting programs. Clearly the market post 82 is a different beast than before therefore i am wary of calls of bottom forming behaviour based on only the patterns of the last 25 years. The All Ords also shows a clear pattern of bottom support along a thick line (we are using monthly data) which was only pierced in the 70’s due to very high inflation. The lessons of our graphs seem clear. Speculation drives the graph higher and rhe market consistently has bottomed along a thick line, the only exception being in huge panic or massive inflation. On that basis i have pencilled in 2700 in the Australian All Ords and about 600 in the S&P 500 as being about where the historical support kicks in. Lets see whats happenes.